Want to decorate your baby's nursery in a more sophisticated/non-cutesy way? Check out these rugs--they are beautiful enough to build a room around. A simple, stylish maternity line from France...and they just happen to be majorly discounted right now. Rikshaw Designs is hosting an online sample sale--details here. Don't miss your chance at any of their swoonworthy textiles! My daughter loves these polkadot shoes and I have to admit they are my favorite too! There is something happy about donning polkadots...especially when they are on super sale. 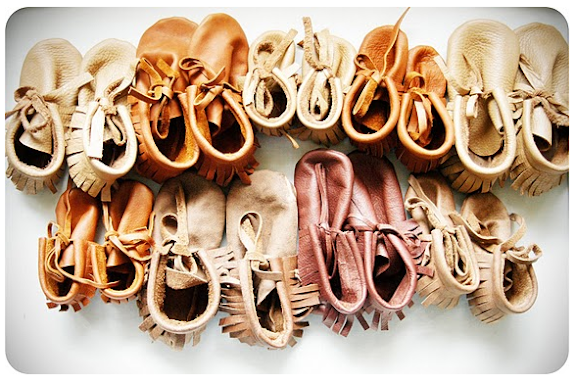 Those moccasins are adorable. What a great gift for a new baby! The moccasins are shrunken-down perfection. Adorable. steph! thanks for the link, so glad you love them.